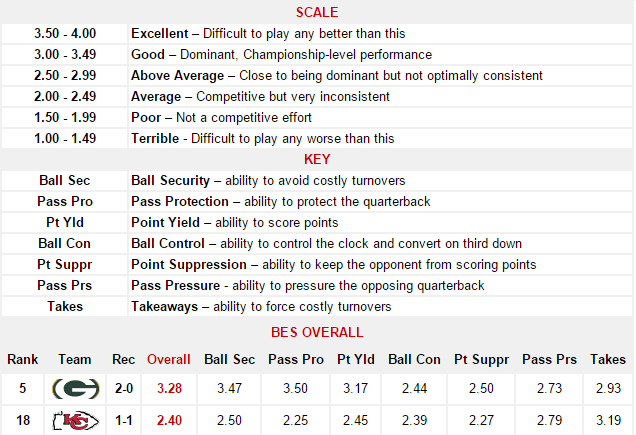 Our Week 2 BES Rankings depict a potentially lopsided Week 3 clash between the Packers (No. 5 BES Overall) and Chiefs (No. 18 BES Overall). However, the Chiefs have a realistic chance to pull off a historic upset over the Packers at Lambeau Field on Monday night. The driving force behind the Packers’ success at home has been two-time league MVP quarterback Aaron Rodgers. Rudimentary logic dictates the Chiefs’ best chances of winning rests with their ability to keep Rodgers and the Packers highly volatile, No. 4 BES Offense on the sideline. To do so, the Chiefs must convert one of their primary weaknesses into a major strength. At present, the Chiefs have a Ball Control score of 2.39, a value further supported by their dismal 15% third down conversion rate on offense. Nevertheless, the Packers own a Ball Control score of 2.44, largely a by-product of their defense allowing a 54% conversion rate on third down. These numbers, along with the Packers allowing 5.3 yards per carry and 154 yards per game on the ground, hint that the Chiefs should opt for a run-oriented attack offensively. A heavy dose of All Pro halfback Jamaal Charles and his backup Knile Davis would greatly aide in the Chiefs controlling the clock and overall tempo of the game. As a result, this would enable them to establish the playaction pass and keep the Packers defense honest. Conversely, the Chiefs defense must do its part for a run-heavy attack to be viable against the Packers. If Rodgers is able to dictate the pace of the game then a monumental, season-defining victory could be quickly pushed out of the Chiefs grasp. A Good Dose Of JC Always Helps! What’s that? Are they banned from recovering fumbles? Lol. they need to worry about hanging onto the ball and not having so many turnovers. Manning is the only one KC has problems with, Chiefs got this!